A rendering of The Uptown Commons development in North Long Beach. Courtesy of Bickel Group Architecture. While one major development in North Long Beach, the Canvas project headed by Anti-Mall founder Shaheen Sadeghi, continues to patiently refine itself during its initial planning phase, two other massive North Long Beach projects face more concrete realities this week with the Planning Commission: The Uptown Commons at the northeast corner of Atlantic Avenue and Artesia Boulevard, and its southern counterpart, The Uptown, at the southwest corner of Atlantic and Harding Street, each project seeking entitlement. 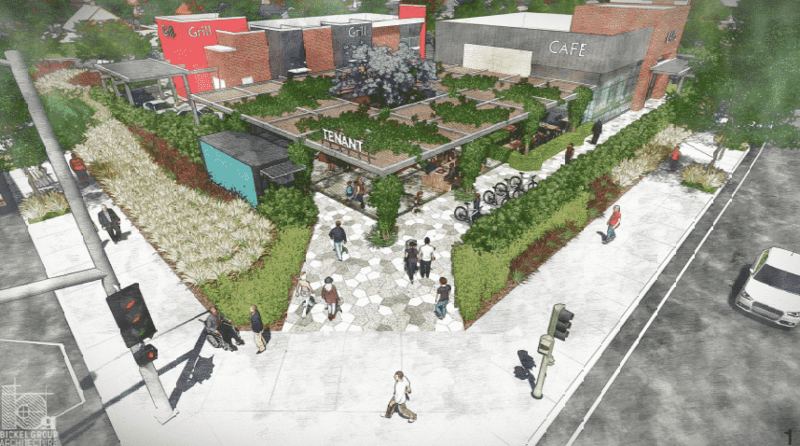 The Uptown Commons takes over an empty, two-acre lot at 6600 Atlantic Ave. in a design headed by Newport Beach-based firm Bickel Group Architecture. 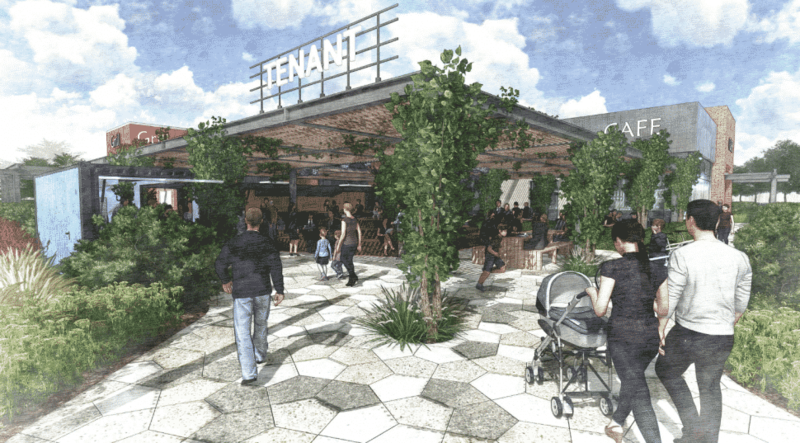 Simple and forward in its design—lots of brick and wood are met with dark metals, atriums, green spaces, and patios—the space will host five new restaurants and offer the neighborhood of District 9 its first full-service bank. Yup, Long Beach’s northern-most district runs so low on basic amenities such as banks and food-centric spaces that, according to 9th District Councilmember and overall North Long Beach development cheerleader Rex Richardson to say that they listened to what folks wanted and went in that direction. And Richardson doesn’t hold back on any pride for the projects—which makes sense since he has largely led the invitation to develop in a neighborhood that has been historically disinvested and removed from the bustle of Long Beach south of Del Amo. The Uptown development at Atlantic and Harding St. in North Long Beach. Courtesy of Westland Real Estate/Architectural Division. Hoping to add to those sought-after amenities will be The Uptown (formerly dubbed Harding Plaza), a 19,632 square-foot development at 6151 Atlantic Ave., between Harding and 61st streets, and including a city-owned vacant lot to the south of the block as well as retail space on the north side owned by Westland Real Estate Group. Pushing its parking behind the new development—the current lot has tons of parking facing Atlantic—and creating an entire storefront stretch from 61st to Harding, The Uptown will let some tenants remain, including the 7-Eleven convenience store. However, the property will be transformed to unify the whole block with contemporary architecture—think shipping containers similar to Bixby Knolls’ SteelCraft but stacked and staggered to create depth and height—while also bringing in coffee (joining Black Ring Coffee as the neighborhood’s sole indie coffeeshops) and North Long Beach’s first craft beer hub thanks to a tap room headed by the Long Beach Beer Lab (also one of the most underrated places to eat in Long Beach). On top of this, a key question Richardson said floated between communities meetings was: Where is the place you go to in North Long Beach to bump into a neighbor? And while spaces that have acted as conduits for this type of interaction have long existed—Houghton Park and Washington Middle School for instance—the community needs newer places to help continue those connections—the success of the Michell Obama Public Library comes to mind.